Madeleine is Missing — The McCanns Vs The Cadaver Dogs — Part 2 – Coercion Code – "Dark Times are upon us"
“I bring to your attention in accordance with instructions received, that today, around 20h00, LPC Assistant Specialists Fernando Viegas and Lino Rodrigues, after seeing recorded images relating to the canine inspection conducted on 31 July 2007 in apartment 5A of the Ocean Club, duly explained in an official statement in the case file, they proceeded to collect [recover] the floor tiles where the dogs used in the activity indicated [alerted to] the possible existence of blood traces along with the position of a cadaver in that location. Those tiles were lifted from the floor, in a way to preserve the possible traces intact for them to be subjected to examination by an authorised laboratory. 24- Two mouth swabs from CSI Bruno Jorge Possid?io Mendes Antunes. Who delivers – Illegible, (to me), handwritten Signature. 16B – White curtain behind blue curtain and armband. Spaniels Eddie and Keela travelled to Portugal with their handler Martin Grime, and were sent into 5A one at a time to see if they could smell anything. “When the dog indicates in the field, it will either be human decomposition or human blood,” Martin tells the documentary makers. “The human decomposition is very persistent, very pungent to the point where we’ve been able to locate, in blind searches, graves 40 years after the body has been removed and the body was only there for a short period of time. It means dogs could give an alert to possible scents from long before the McCanns stayed there. Eddie, who was trained to smell traces of human cadavers, was sent in first with Martin and ran through the whole apartment. “Eddie’s behaviour changed the moment he came through the door of the apartment,” investigative journalist Robbyn Swan tells the camera. “He became tense and aware. 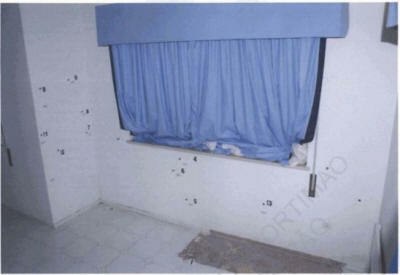 Both parents were named as arguido – persons of interest – days after the dogs were brought in, but that status was lifted in 2008 when the case was archived by Portuguese police.